Sirui has four Series of monopods; P, PC, PS and EPS Series. There are several monopods in each range with variances of material, size and features in each one. The PS and EPS series are those that include stabilising feet. 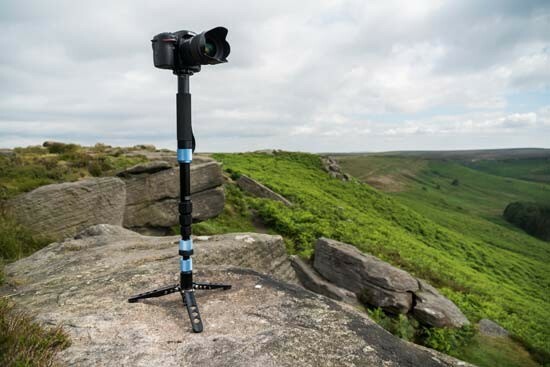 The Sirui P-204S monopod being reviewed here is a four-section aluminium monopod with stabilising feet, that is part of Sirui's PS Series. Unlike many other brands, Sirui tends not to offer its monopods as part of a kit that includes a head. Such is the case here - you will need to buy a head separately should you wish to use one with the Sirui P-204S. A tripod head is not an essential part of a monopod like this one and later we will explain why. The Sirui P-204S is priced rather competitively at £149.99. Sirui has a range of tripod heads available in its online shop, with the video heads starting from £149.99. The monopod's top plate features a reversible 1/4in & 3/8in screw, so any tripod head can be attached. For our review, the Sirui P-204S monopod has accompanied us through a number of outdoor shoots and had regular use for a good time now. We’ll say this right off the bat, the Sirui P-204S is a well made and hard wearing bit of kit. It packs in a fabulous array of features that enhance the handling and create a versatile camera support. Before we describe our experience with the monopod, let’s take a look at the key features, specification and what is in the box.